Where are the thrills of gardening? Where are the chills? The excitement? Where can you walk the tightrope of the garden, where one ill-timed freeze could cause a bloom to fall off and become compost? Where can you get all this in gardening? 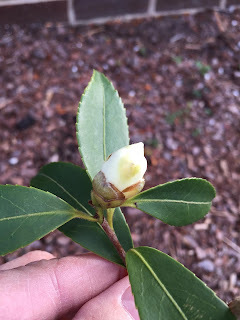 You can get all this in my Garden of Southern Follies and Delights, where right now one of the three camellias I planted last spring has buds starting to open, showing the tips of the petals. Ladies and gentleman, fellow gardeners, gardening on the edge of your hardiness zone is not for the faint of heart. Stay tuned to see if this bloom opens, if it successfully walks the tightrope of weather. Find out if other camellia blooms will follow. Some say the show is over in the garden for this season, but here, where we are gardening on the edge, there is one final act, one grand finale, one dare-devil feat of gardening still to watch. Stay tuned. The camellias are just coming on stage. A few years ago they told those of us gardening in SE Michigan that we could plant varieties that previously would not survive here. Then we got two winters from Hell. It was touch and go with a Sweet Gum tree that is right on its northern edge. I'm sticking with the truly hardy stuff from now on. It's the greatest show on earth! Inspirational! Hopefully up here near lake Erie we wont have the amount of cold early in the season as we did last year! Haha, it is good to keep challenging the limits of gardening. I found you website by coincidence and really like the articles and enthousiasm!